As we shared earlier, 90% of millennial women are confident that the vehicle they ultimately purchase will satisfy their needs. This overwhelming confidence begins to wane, however, when you begin to dive deeper into the specific aspects of the purchase process. As part of our 2017 POPSUGAR Insights Auto Report, we surveyed over 1,200 US millennial female in-market auto shoppers to better understand their perspective on shopping for their next vehicle. Overall, women were least confident with the concepts of negotiating the final purchase price of their vehicle (24%), navigating the dealership visit (23%), and the financing process (22%). 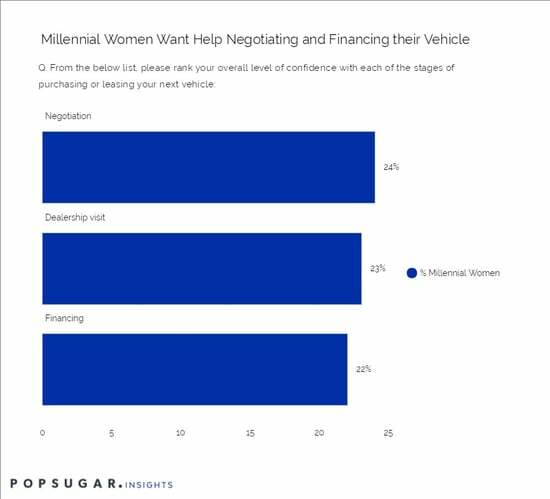 We found that millennial women were more confident in the aspects of the purchase process where they retained direct control of the outcome and less confident in the aspects where they needed to interact with the dealer to negotiate or finance their vehicle.